Dhoni has been the best Indian captain, and Yuvraj is the best Indian player since World Cup. Yuvraj is leading second IPL team, after Kings XI, while Dhoni has stuck to the same team and made it the most successful IPL team among all. The match is not only just a match, it will be another announcement in Indian cricket. Note: 2011 record is updated till Match 28 and the game before Pune Warriors vs Chennai Super Kings at Mumbai. When Dhoni came to Indian Cricket, Yuvraj was already a hero and was being looked as future captain of India. But while the reasons are history, current fact is Dhoni is the indisputed most successful Indian captain ever in Cricket history, while Yuvraj has lost his permanent place at different formats of game. Yet it was Yuvraj’s calibre, and Dhoni non-competitive belief in him that has seen Yuvraj play many more international matches, than many other unsuccessful players who got numerous chance to prove themselves. Not only Dhoni, but all know that Yuvraj has special talent. It is not about his batting or bowling or fielding, it is about the temperament in which he plays an international matches. That seperates him from the rest and that has earned him Indian caps many times. Dhoni on the other hand has never felt threatened by Yuvraj’s stature. He prefers to remain under Yuvi’s star status and feels happy to apply means to let his team to another victory. Including Yuvraj he has given many others enough opportunities as for him country comes above his own success. The same attitude to provide the best Indian talents chances such as Yuvraj to play all the matches, who received the Man of the Tournament award of 2011 World Cup too, has earned Dhoni plaudits from all and got winners for India everywhere. Dhoni is himself a mercurial batsman. He cannot bowl but he can score runs at will. A nudge is always there for single, against anyone and when required he can hit 50s and 100s as quickly as lightening can reach earth from cloud. His devastatively cool temperament got him to the captaincy position. Yuvraj 34 Tests, 52 innings 1639 runs, 169 Highest, Avg 35.63 3 Centuries, 9 half-centuries, 30 catches. Dhoni 54 matches, 82 innings, 2925 runs, 148 Highest, Avg. 40.06, 4 centuries, 20 half-centuries, 148 catches. Yuvraj 274 matches 252 innings, 8051 runs, 139 highest, Avg. 37.62, 13 centuries, 49 half-centuries, 84 catches. Yuvraj 23 matches, 22 innings 567 runs Highest 70, 4 half-centuries. 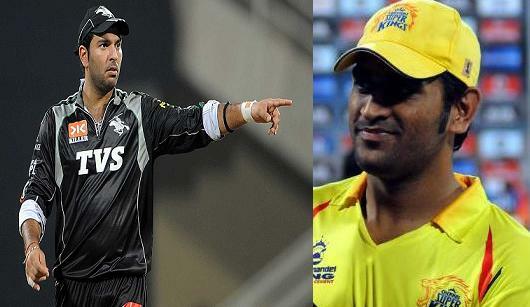 Dhoni has been the most expensive player of IPL 2008 auction and has proved his value by taking his team to the top, while Yuvraj Singh could not do contribute enough despite being adjudged as Icon Player. Now, Yuvraj Singh is leading a new team and the difference is visible in the team’s good show so far. Dhoni, on the other hand, is seeing a major unexpected slump in his team’s fortune. Both have a lot at stake. The better captain will win the battle today in Mumbai.